An acquaintance recently told me that her special-needs dog was having a hard time getting on and off the couch because jumping was difficult. She wasn’t familiar with dog ramps, so I told her about the low-cost DIY dog ramp we created to help ease Peanut’s travel up and down from “her spot” on the couch. The alternative is to lift me up and down at my command. The choice is yours. We decided a few years ago that it would be best to keep Peanut from jumping on and off furniture to limit the impact to her wrist joint, which was progressively getting weaker over time. We tried doggie stairs that we bought from the store but were unhappy with the product. The width of the stairs was too narrow, the woolly fabric that loosely covered the bumpy plastic was too thin, and the whole frame was just light enough to be wobbly under Peanut’s weight as she moved, freaking us both out. We checked out manufactured dog ramps as well, but they were either too industrial or just too expensive. Our little Goldilocks needed something that was just right. Since what we needed was just a simple, sturdy board, we made our own. We went to our local big box home improvement store to browse wooden boards. An associate assured us several times that our particular selection would more than support the weight of a 17 pound dog. (The ramp actually supports me, and I’m a few stones heavier.) In addition to having the board cut there to our specifications, we also purchased some inexpensive carpet off the roll that would not snag on her nails and that I thought would nicely compliment the room colors. After stapling the carpet to the board and doing a practice run with Peanut, we quickly learned that we needed something to create more friction under paw. The carpet fibers were a bit too slick. I happened to have several rolls of rubber non-slip liners, so we secured a roll of that over the carpet. It did the trick beautifully, creating the resistance she needed to safely walk up and down the ramp. 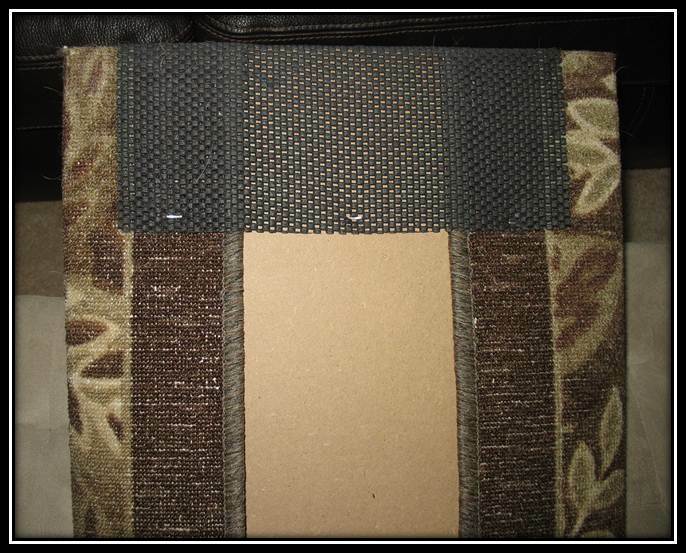 Non-slip rubber liner wrapped across the length of the board (could also use a non-slip carpet or rug pad) Our rolls of rubber liners happen to be intended to line tool box drawers. I’ve also seen similar liners sold for use in kitchen drawers that keep items from sliding around. We kept it simple but I could have easily added decorative trim to the sides just for fun. Back of dog ramp, carpet and non-slip pad stapled to the board. The weight of the ramp resting at an angle on the carpet makes it quite sturdy. It does not budge at all when Peanut trots up or down, not even when she puts a bit of speed into her dismount. We don’t use it on tile flooring, but I did set the ramp up on our tile floor in the kitchen to see what would happen-specifically whether or not it would slip. It did not slip, likely due to the weight and the rubber non-skid liner wrapped around the bottom that rested against tile. I would still make sure that if using on a slick surface like tile that you test to verify that the ramp will not slide. Otherwise, ensure you add a stopper to prevent sliding or even make the ramp triangular, the way many other DIY ramps are constructed. The board can be placed under the couch if we need it out of view, but that doesn’t happen too often. A handle could also be drilled in to the side for ease of grabbing and sliding under furniture. Training should be pretty quick and easy for a food-motivated dog. We held a treat at the base of the ramp, called out “ramp” and gave Peanut a treat. We then held the treat a few inches higher up the ramp, forcing her to take two steps up to reach the treat. As she did that, we called out “ramp” and gave her the treat. We repeated this process every couple of inches until she walked herself up the ramp and on to the couch. We lavishly praised her for a job well done, and promptly started the process of going back down. She picked up the new skill very quickly. Now, we just call out “ramp” when we need to direct her on or off the couch. My online searches for DIY dog ramps didn’t turn up the best results, so I offer up this idea to anyone who needs such an aid as part of their pet’s occupational therapy. Update 6/26/13: Since this is by far my most popular page, I would love to get more feedback if you tried this little project yourself and how it worked for you. Thanks! Thanks so much for your reply Amy! I’m glad that you think the idea is useful for your design, good luck! 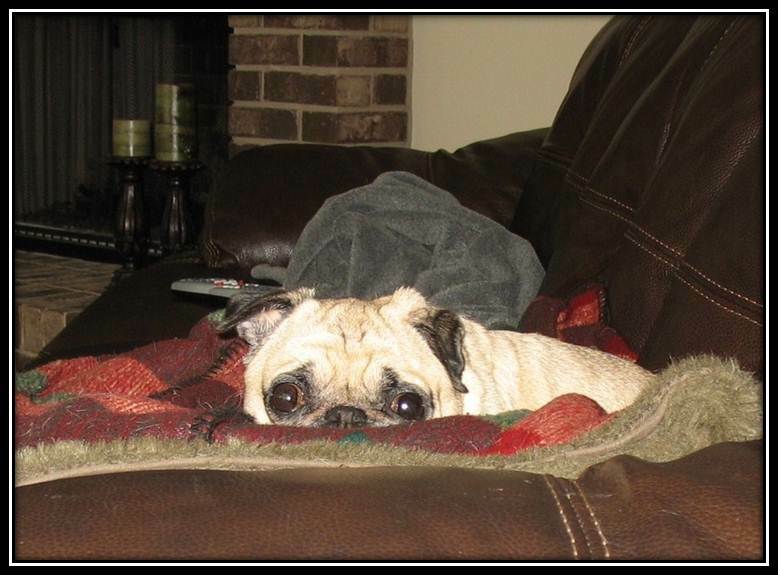 No, I find that there is hardly anything that we pug parents won’t do for them. Thanks so much for saying that!! Peanut is a wonderful girl. Thanks Raquel, I hope this works out for your Boston too! Hi Colleen, how kind of you to give those puggies a 2nd chance and try to ease their mobility. It sounds like these stairs are outside? My husband said that the rubber liner might not hold up well outdoors but thought that something like AstroTurf might afford durability while providing some resistance against slipping. I’m positive that the store had outdoor-use carpet as well as inexpensive synthetic grass available off the role. Maybe large pieces of those types of material would hold up to the elements while allowing puggie to keep his grip. I’m also aware that some stores also sell non-slip tape for outdoor use (I’ve never tried it) but that might also be a possibility with your materials. Thanks for your reply and good luck! I love adopting the old pugs. They are so beautiful and so is yours. Thanks for the suggestions. I ordered my ramp right after I read your blog. I will use outdoor carpet but I think I am still going to try the liner first because nothing moves on it in the kitchen and I think astro turf still might be too slippery. I live in So. Calif and unfortunately at the moment we don’t have any elements, particularly rain so I think it might be OK. I really appreciate all of your ideas. Great article. I tried something like this but ended up purchasing this: http://www.loadingrampstore.com/cat/Dog-Ramps-and-Pet-Stairs/1.html. It ended up being cheaper than the materials. Thanks Robin, I appreciate the comment. Glad you were able to find a good, easy, inexpensive solution. Going to try this with a very large board outside to eliminate the steps for two dogs, one Bichon and one Carolina Dingo, but both with issues. Husband says it won’t work, I say it will. I’ll let you know! Hi Susan, thanks for checking this out and giving it a try. We’re in the same camp that anything to help make things a little easier on them is worth the effort. Hopefully your husband will soon be saying, “OK…you were right.” 🙂 Good luck!! Thanks for the idea! My senior cat loves jumping from my couch to floor. He currently has a cushioned stool but had an accident recently and did not fully make it to the stool and hurt himself. I believe the ramp will be a lot more ideal and safer, cutting out the jumping up and down. Thanks again for your post!! Thanks so much for your comment, Brittany. Poor guy! Hopefully he takes to the ramp quickly and enjoys taking the easy route on and off the couch. Good luck!